'History is the version of past events that people have decided to agree upon', said Napoleon. Yet the actual writing of history, especially ancient history, is a practice that often prompts more discord than assent. In his new textbook, Luke Pitcher aims to overcome the hostility which exists between two rival camps in their study of classical historiography. The first camp looks at the classical historians with an eye to what data they can provide about the ancient world. The second camp examines the ancient writers as literary texts in their own right, employing the tools of literary criticism and engaging with such matters as narrative artistry.Attempting to fuse these two - mutually suspicious - approaches, Luke Pitcher's attractive introduction offers undergraduate students of classics the first comprehensive introduction to historiography in antiquity on the market. It unites the nitty-gritty of the historian's trade (the finding and managing of data) to an awareness of the importance of style, form, allusion and composition. The book also seeks to do justice to individual classical historians, and discusses such important figures as Livy, Tacitus, Herodotus, Cicero, Plutarch and Lucian. A comprehensive bibliography and glossary are included. 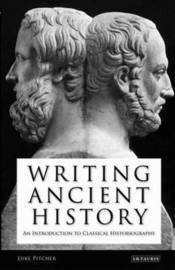 "Writing Ancient History" at last does full justice to the mechanics of history-writing in the ancient world. Luke Pitcher is Fellow and Tutor in Classics, Somerville College, Oxford. He has studied and written extensively on the subject of historiography in antiquity.